Poroshenko meets Ukraine troops Jump to media player Ukraine says most of its troops have pulled out of the strategic town of Debaltseve in the east of the country. Relief for Ukraine troops heading home Jump to media player The Ukrainian president says his forces are making an "organised" withdrawal from the embattled town of Debaltseve. Ukraine artillery fire 'ongoing' Jump to media player The organisation monitoring the situation in Eastern Ukraine says that the ceasefire is largely holding but there have been reports of artillery fire in areas including Debaltseve and Luhansk. Putin: 'Ukraine fighting has decreased' Jump to media player Russian President Vladimir Putin has said fighting in eastern Ukraine has decreased since the ceasefire came into force at the weekend. Footage of Ukraine troops 'retreating' Jump to media player Footage appears to show several dozen Ukrainian troops retreating with their weapons from the strategic town of Debaltseve. Ukraine crisis: Ceasefire under strain Jump to media player Fighting around the key Ukrainian town of Debaltseve appears to be continuing, despite a ceasefire coming into force last week. Gas pipeline burns in Ukraine 'ceasefire' Jump to media player Two days after a ceasefire was meant to begin in eastern Ukraine, it seems neither government forces nor Russian-backed rebels are honouring the truce. Fleeing artillery fire amid Ukraine truce Jump to media player The ceasefire in eastern Ukraine is looking increasingly fragile a day after it was meant to start. Debaltseve's fragile ceasefire Jump to media player The Ukraine ceasefire between government forces and Russian-backed separatists is being observed although some shelling has continued. Lavrov: 'Lives of troops a priority' Jump to media player Russian foreign minister Sergei Lavrov confirms that Ukrainian troops are withdrawing from the strategic town of Debaltseve in the east of the country. Debaltseve: 'We were not encircled' Jump to media player Ukraine's President Petro Poroshenko says Ukrainian troops have made a "planned and organised" withdrawal from Debaltseve. Ireland women target Olympics place Jump to media player Ireland's women's hockey team prepare for World League 2 which is part of the qualifying process for the 2016 Olympics. Ukraine says most of its troops have pulled out of the strategic town of Debaltseve in the east of the country. Forces there have been under sustained attack from pro-Russian rebels, despite the ceasefire agreement signed last week. 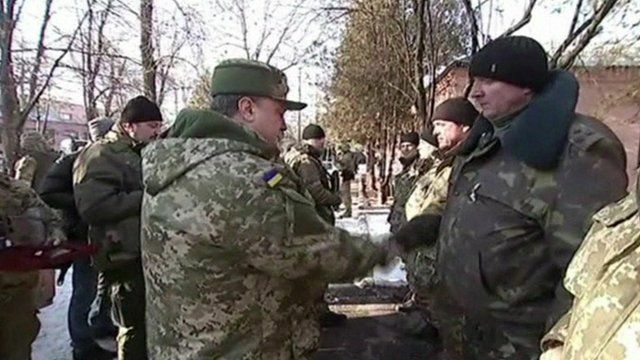 President Petro Poroshenko flew to the region and has been meeting troops who left on Wednesday morning. Paul Adams reports from near Debaltseve.